Amrita and her family were travelling to London, England for her birthday. Coming all the way from India, Amrita wanted to capture some terrific family photos, as well as some of the better-known sights in London. In order to do this, and still have everyone in the photo, she hired photographer Agata. The capital of the United Kingdom and known worldwide for being the paragon of British culture, London dates from pre-Roman times. Its rich history and incredibly diverse population make it one of the top tourist draws in the world. Iconic and instantly recognizable landmarks include Westminster Abbey, as well as “Big Ben”, St. Paul’s Cathedral, and the London Eye. London has something for everyone, from fish and chips in newspaper to fine cuisine. It is especially known for its lively theatre district, world-class museums and galleries, not to mention fine boutiques and incredible department stores like Selfridges and the exceptional Harrods. It was in this famous landscape that Amrita wanted to have her family photo shoot done. To capture her vacation, she hired a professional family photographer in London, Agata, to take photos of the small group. To showcase London at its best, Agata chose some perfect locations, including an iconic red phone box, with the Westminster tube station sign in the background, as well as views of the London Eye and even a red double-decker London bus and black London taxi. It is a nice change to have professional family photos taken somewhere other than a studio filled with lighting umbrellas and props. 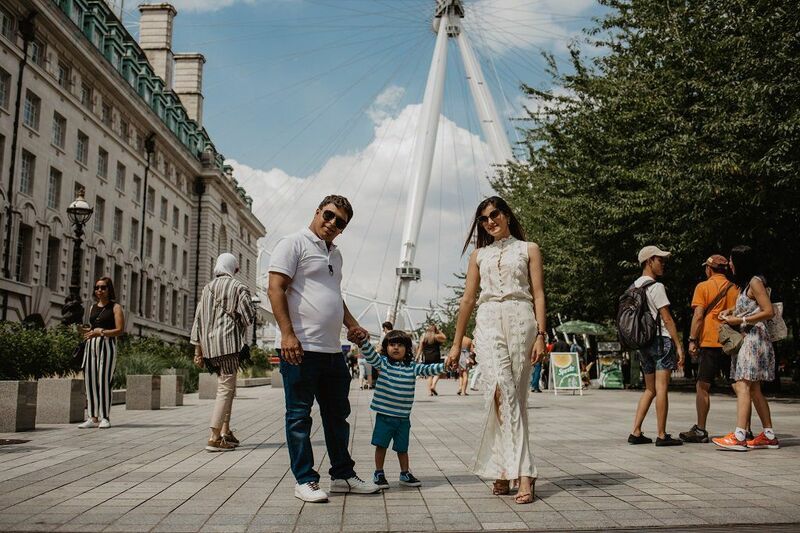 In London, Amrita was able to enjoy her family vacation with her husband and 21-month-old son, all the while knowing that she would have some wonderful, professional photos at the end with which to remember their holiday. 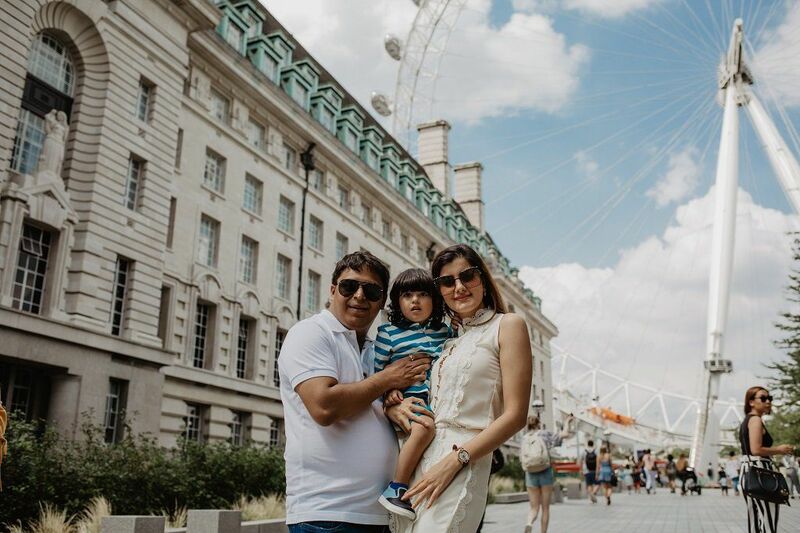 Dressed elegantly but comfortably (London is also the fashion capital of the UK), the happy family is seen enjoying their time together, taking in the views around them, and just being together, far from their daily routine. Agata took images of each of them together, as well of Amrita with her son, and alone with her husband. Agata also captured some sweet moments between father and son, and Amrita’s mother, who was vacationing with them. She also took several “model shots” of Amrita by herself, showing her particularly stylish side. In true testament to Agata’s skills, the photographs are composed beautifully. The slightly overcast skies made for perfect lighting. Although they are staged, none of the images are overly posed – instead they are fun, and even silly at times. You can almost hear the sounds of the London traffic as the family chats happily, having their photos taken. The nice thing about hiring a professional photographer to take family photos is that you know you will get well-focused and well thought out images, instead of blurry selfies, or with someone missing from the group. A professional photographer can make a huge difference. Our vacation photographers know where to find the perfect views, and want to give each of their clients the best possible experience, and great memories to last a lifetime. They are often local experts and can suggest the very best sites for all kinds of photo shoots, including casual family holidays.